This light, spacious, self-contained apartment suitable for couples, families and larger groups has 3 en-suite bedrooms, big windows overlooking the green and river and a lovely roof garden with cane seating and plants. 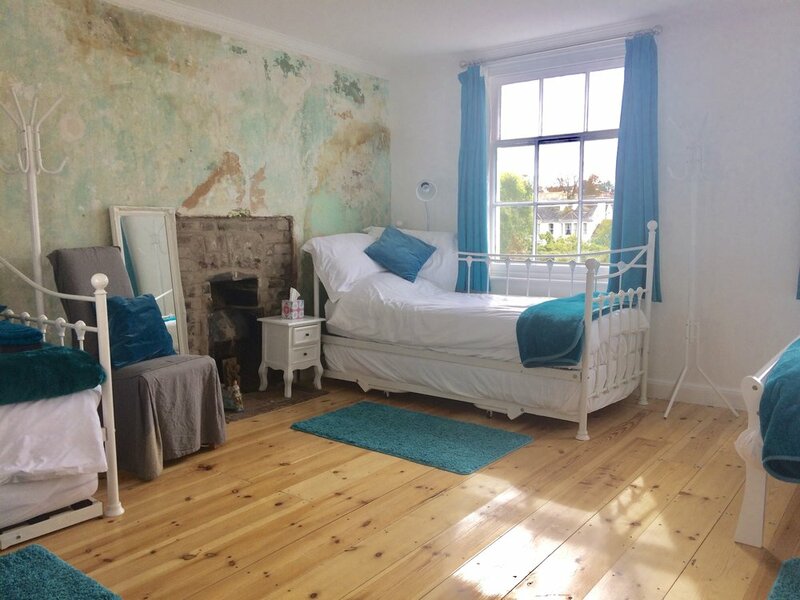 It is newly refurbished with original paintings, sleeping up to 9 guests with a kitchen diner on the top floor of the Sea Light, a period property built in the 1890s, which houses a fine art gallery, tea rooms, massage therapy rooms. Located in the centre of the picturesque town of Dawlish, the beach is a few minutes walk away. All our beds have 400 thread count 100% cotton sheets and quality mattresses to give you a good night's sleep. In addition to bedding, we provide towels, hair dryers and shampoo. The well equipped kitchen has a dishwasher and washing machine, TV plus all you need to prepare and serve a meal. The dining table seats six, with a sofa and table for relaxed seating and a large L shaped corner desk for any work you’ve brought with you or a place for children to draw. The good sized entrance hall has space for coats and boots. Wifi is available. Overlooking the picturesque green and just five minutes from Dawlish beach, the Sea Light is the perfect setting for a Devon seaside escape. To book please visit our Airbnb page. Bedroom one sleeps up to five with a king or twin beds and two singles and a brand new en suite bathroom with a walk in shower. This room has the best views over looking the pretty village green and brook beyond with its famous black swans.. This light airy room can sleep up to 3 with a king size bed and single bed. With its own en suite shower room and is bright and clean with a Georgian window to the side of the building. Bedroom 3 has two single beds with French windows leading onto a spacious roof terrace garden with rattan lounge furniture and plants. A lovely sun trap for relaxation. This room has its own bath room with bath and shower. "It's a lovely, bright, comfortable apartment, fitted out with everything you need - dishwasher, washing machine, etc. It is absolutely as good as the pictures make it look - gorgeous cosy throws, nicely fitted out bathrooms. The beds were really comfortable and the showers were superb. Kian let us in and explained the arrangements for getting in when the cafe wasn't open and was a lovely host. The apartment is very easy to find - it is on the main street in Dawlish, and looks out over the green. Hope we get a chance to stay again!" "Perfect accommodation, perfect host, perfect attention to detail, perfect location... just perfect ! Katie and Kian were amazing hosts, their communication was very prompt and they were very helpful in every way . The property is spacious, immaculate, had loads of character, and a really lovely peaceful ambience. I stayed here with my children and dog and we spent our days on the beach by the caves and at the amusements. The local restaurants are lovely. But there is plenty to do in the area if you want to. Again, Katie was very helpful with suggestions of places to eat and visit. We spent our evenings at the flat and Katie and Kian went out of their way to be helpful, finding books for my children, etc. Our hosts had thought of everything that we could possibly need; milk, breakfast cereals, coffee, etc as well as lots of other thoughtful little touches. As an extra bonus Katie and Kian own the coffee shop below the apartment which is the most relaxing coffee shop I have frequented (and I drink a lot of coffee!) In short, I thoroughly recommend Katie and Kian's apartment and coffee shop. You won't be disappointed." "Katie was lovely, super responsive and helpful. Her apartment was cosy, spotless and had everything required supplied." All rooms are provided with bedding, towels, hair dryers and shampoos. The top floor rooms share a modern kitchen and dining space with a TV. The shared kitchen includes a fridge/freezer, cooker, washing machine and dishwasher and are stocked with crockery, cookware and store-cupboard essentials such as teas and coffees. Wifi is available throughout most of the building. Dawlish on the South Devon coast is a traditional seaside town with one of the finest beaches in Devon, a nature reserve and easy access to the South West Coast Path. From families to hikers the pretty town has something for everyone. Spend a day at Dawlish Warren - golden sandy beaches, a nature reserve and fun park means you'll never be bored. Explore local history at Dawlish Museum or become a secret agent for a day with the Dawlish Spy Treasure Trail. Take this self-guided walk and solve the clues using the buildings, monuments and local landmarks. Bring your bikes or hire some and explore the Exe Estuary Trail. Cycle all the way to Exeter and down to Exmouth on the opposite side of the estuary. And if you're legs are too tired to bring you home you can take the picturesque train or jump on the water taxi back to Starcross. With plenty of cafes and restaurants to choose from you'll find all you need to enjoy your stay in our pretty town.